I have always been a fan of Jerry Spinelli, but this book has to be my favorite! Many YA books encourage individuality, but none of them are quite as effective in their message like Stargirl. 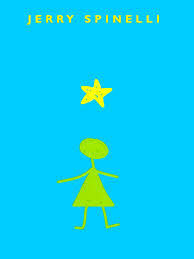 The actual character of Stargirl is charming and encourages her peers to break the conformity and just be themselves. Therefore, I think this book’s overall message is perfect for anyone. Whether you’re carrying your pet rat and playing your ukulele, like crazy Stargirl or reading upstairs in your room, like me, just be yourself. Stargirl proves that there can be only one you! Live your life! This book is a super quick read and perfect for summer. This is the first book in the Stargirl duology. I look forward to reading the second one! It is such a fantastic book!! Yes! The second book’s premise sounds SO interesting! I can’t wait! !